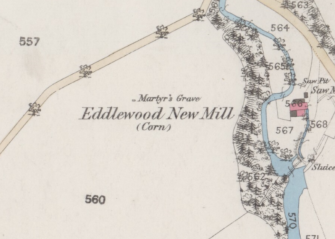 Detail from Ordnance Survey 25 Inch map, 1860s. The grave was located where a concrete slab is located in the pavement in front of 5+7 Westwood Crescent, Laighstonehall, Hamilton. There is no inscription. The grave of a Covenanter who was wounded at the Battle of Bothwell Bridge is to be found at Westwood Crescent, Hamilton. He is thought to have died here, perhaps slain by pursuing soldiers. The site of the grave is now built up, but a slab in the ground in front of numbers 5/7 Westwood Crescent, Hamilton, marks the spot.